Description. Long-legged myotis are small bats, but one of the larger species of Myotis in Washington (Table 5). Fur color on the back ranges from reddish brown to blackish in the subspecies M. v. longicrus and is reddish buff in M. v. interior (Warner and Czaplewski 1984, Nagorsen and Brigham 1993, Verts and Carraway 1998). Fur on the underparts is relatively dark and extends to the undersides of the wing membranes, where it reaches the elbows and knees and is longer and denser than in other Myotis. Ears and flight membranes are blackish brown. Ears have rounded tips and are relatively short, barely reaching the nose when pushed forward. The tragus is long and slender. The foot is relatively small, about half the length of the tibia, and the calcar has a distinct keel. Taxonomy. Four subspecies are recognized (Simmons 2005), with two present in Washington (Warner and Czaplewski 1984). Myotis v. longicrus ranges across most of the state and is replaced by M. v. interior in southeastern Washington. Distribution. Long-legged myotis are distributed from southeastern Alaska, Northwest Territories, and western North Dakota southward to central Mexico (Warner and Czaplewski 1984; Appendix A). This species has been recorded in nearly all counties in Washington (WDFW WSDM database). Population status. This bat is common to abundant in much of the West (Barbour and Davis 1969, Oliver 2000, Adams 2003), but firm data on population sizes and trends are generally lacking (NatureServe 2009). In Washington, capture surveys have found it to be the most common or second most common species at sites in the southeastern Cascades (Frazier 1997, Taylor 1999, Baker and Lacki 2004). However, similar surveys elsewhere have reported it as uncommon in the southwestern Cascades (West et al. 1984, Thomas 1988), Mt. Rainier National Park (Petterson 2001), North Cascades National Park (Christophersen and Kuntz 2003), the Olympic Peninsula (Erickson et al. 1998, Jenkins et al. 1999, West et al. 2004), Joint Base Lewis-McChord (Wunder et al. 1992, Falxa 2008a), and Badger Gulch in Klickitat County (Fleckenstein 2001a), or as rare or absent in the Selkirk Mountains (Campbell 1993), Moses Coulee (Fleckenstein 2000, Rosier and Rosenberg 2006), Hanford (Gitzen et al. 2002, Lindsey et al. 2012), the Yakima Training Center (Christy et al. 1995), and San Juan Islands (Dalquest 1940). The species may be common in the Blue Mountains, based on the findings of Henny et al. (1982) for the Oregon side of the Blues. Habitat. Long-legged myotis occur mainly in moist and dry coniferous forests, but also inhabit riparian forests and dry rangeland (Warner and Czaplewski 1984, Nagorsen and Brigham 1993, Johnson and Cassidy 1997, Oliver 2000, Adams 2003). Thomas (1988) reported a strong preference for old-growth forest over fire-regenerated mature and young forests, but other studies have found broader use of different forest age classes if sufficient roosts are present (Ormsbee and McComb 1998, Humes et al. 1999, Taylor 1999, Johnson et al. 2007, Arnett and Hayes 2009). Elevational distribution ranges from sea level to 3,500 m (Nagorsen and Brigham 1993, Adams 2003). Males occur more commonly at higher elevations than reproductive females at some locations (e.g., Cryan et al. 2000), including a site in Washington’s southeastern Cascades (Baker and Lacki 2004). Surveys in shrub-steppe in the Columbia Basin have found the species to be scarce or absent (Christy et al. 1995, Fleckenstein 2000, Gitzen et al. 2002, Lindsey et al. 2012), but it is perhaps more likely to be present along the region’s water courses (Johnson and Cassidy 1997). Roosts and roosting behavior. Roost sites include snags and live trees with loose bark, long vertical cracks, or hollows; cracks and crevices in rocks, stream banks, and the ground; buildings; bridges; caves; and mines (Barbour and Davis 1969, Warner and Czaplewski 1984, Nagorsen and Brigham 1993, Chung-MacCoubrey 1996, Ormsbee and McComb 1998, Rabe et al. 1998a, Baker and Lacki 2006). In the Pacific Northwest, maternity sites have been mainly found in snags, but live trees, rock crevices, mines, and buildings are also used (Nagorsen and Brigham 1993, Ormsbee and McComb 1998, Baker and Lacki 2006, Johnson et al. 2007, Arnett and Hayes 2009, Lacki et al. 2010; BLM, unpubl. data). A number of traits characterize the snags and trees used by reproductive females. Roost snags and trees are typically taller and larger in diameter than other snags and trees in the surrounding canopy, are farther from neighboring tall trees, occur in areas of lower canopy closure, and are in the early to intermediate stages of decay when more loose bark remains for roosting under (Vonhof and Barclay 1996, Frazier 1997, Ormsbee and McComb 1998, Rabe et al. 1998a, Taylor 1999, Baker and Lacki 2006, Arnett 2007, Johnson et al. 2007, Arnett and Hayes 2009, Lacki et al. 2010). These features presumably provide bats with greater numbers of potential roost spaces as well as increased warmth from sun exposure, which hastens the growth of young (Arnett and Hayes 2009). In dry forests, ponderosa pine and firs are the main species used for roosting (Chung-MacCoubrey 1996, Rabe et al. 1998a, Cryan et al. 2001, Baker and Lacki 2006), whereas Douglas-fir is the primary species occupied in moister forests (Ormsbee and McComb 1998, Arnett and Hayes 2009). In western Oregon, Ormsbee and McComb (1998) and Arnett and Hayes (2009) located maternity roosts in all age classes of forest, although stands 41-80 years old on federal lands were most used and younger stands were least occupied. Roosts were generally located in upland habitats and closer to streams. In eastern Washington and eastern Oregon, pregnant females roost about evenly between upslope and riparian locations, whereas nursing and post-nursing females spend much more time roosting upslope (Baker and Lacki 2006). However, in Idaho’s Bitterroot Mountains, females prefer mid-slope roosts throughout the reproductive season (Lacki et al. 2010). Most maternity colonies contain fewer than 50 bats, but larger roosts of up to several hundred bats are regularly present (Nagorsen and Brigham 1993, Ormsbee 1996, Baker and Lacki 2006). Reproductive females usually switch day roosts about once every two to three days on average (Ormsbee 1996, Baker and Lacki 2006, Arnett and Hayes 2009), although Vonhof and Barclay (1996) reported an average of 11 days between changes. Duration of roost use may be influenced by reproductive stage of the female, the characteristics and lifespan of the roost, and weather (Vonhof and Barclay 1996, Baker and Lacki 2006). Large colonies appear to move en masse when switching roosts (Baker and Lacki 2006). Females have been reported moving averages of 28 m, 413 m, and 1.4 km between successive roosts (Ormsbee 1996, Vonhof and Barclay 1996, Baker and Lacki 2006). Males and non-reproductive females roost primarily in large snags and to a lesser extent in live or partially dead trees (Nagorsen and Brigham 1993, Herder and Jackson 1999, Frazier 1997, Taylor 1999). Frazier (1997). In the eastern Cascades of Washington, Taylor (1999) found selection for tall, large-diameter snags and trees, and a preference for grand fir, which often features loose bark. Taylor (1999) reported that males selected roosts in the oldest available forest stands; late-successional forest was used on national forest lands, and moderately mature forest stands, middle to late successional pine/oak stands, and aggregate retention patches were preferred on a nearby commercial forest. Canopy cover and height, stand diameter, basal area, and tree density were all significantly greater for roosts on national forest lands compared to roosts in commercial forest. Males also selected snags in earlier stages of decay and with more exfoliating bark on national forest (classes 1-3) than on private forest (classes 1-5). Use of large snags by males has also been recorded in western Washington (Wunder et al. 1992). Males and non-reproductive females make frequent roost changes (once every 1-10 days) during summer (Vonhof and Barclay 1996, Frazier 1997, Taylor 1999). Bridges, abandoned buildings, caves, mines, and trees in riparian habitats are used for night roosting (Barbour and Davis 1969, Perlmeter 1996, Ormsbee and McComb 1998, Adam and Hayes 2000; G. Falxa, pers. comm.). At bridges occupied at night in Oregon (Perlmeter 1996) and Washington (G. Falxa, pers. comm. ), females outnumber males and roost in clusters or alone, whereas males are solitary. Counts at night roosts are highest in August when most females are pregnant or nursing, and roost temperatures are at their maximum (Perlmeter 1996). Larger bridges with warmer than ambient temperatures attract the largest numbers of long- legged myotis (Perlmeter 1996). Ormsbee (1996) reported an average distance of 2.5 km (range = 0.7-6.5 km) between night roosts and day roosts. Caves and mines are used as winter hibernacula (Warner and Czaplewski 1984, Nagorsen and Brigham 1993, Adams 2003). Hibernacula usually contain more males than females (Senger et al. 1974, Adams 2003). 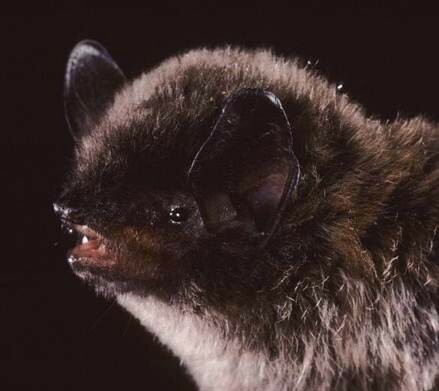 Long-legged myotis have been found hibernating alone or in aggregations of 2-64 individuals in lava tubes in Skamania County and in caves in Klickitat County, Washington, and in Oregon (Senger et al. 1974, Perkins et al. 1990). Winter surveys of more than 650 caves and 70 buildings in these states during the 1980s found this species at nine caves (Perkins et al. 1990). Hibernation in Washington extends from about early November to late March (Senger et al. 1974). Senger et al. (1974) reported a tendency by individuals to reuse the same hibernacula between years. Perkins et al. (1990) noted that long-legged myotis sometimes hibernate in clusters. Reproduction. Sperm production in males occurs in July and August (Warner and Czaplewski 1984, Baker and Lacki 2004) and mating takes place in late August or September before hibernation (Nagorsen and Brigham 1993). Females store sperm overwinter, with ovulation and pregnancy occurring in the spring (Warner and Czaplewski 1984). Females produce one young per year. Timing of births is variable and probably influenced by elevation and latitude (Barbour and Davis 1969). In the Pacific Northwest, births occur between late June and mid-August (Nagorsen and Brigham 1993, Holroyd et al. 1994, Perlmeter 1996, Baker and Lacki 2004). Some males and probably some females breed in their first autumn (Schowalter 1980, Warner and Czaplewski 1984). Food habits and foraging. Moths are the dominant prey, with termites, flies, beetles, lacewings, wasps, leafhoppers, true bugs, spiders, and other invertebrates also eaten (Warner and Czaplewski 1984, Warner 1985). In eastern and western Oregon and north-central Idaho, moths comprise 42-78% of the diet (Whitaker et al. 1977, 1981a, Henny et al. 1982, Johnson et al. 2007, Lacki et al. 2007b, Ober and Hayes 2008a). Beetles are also important in Idaho. Long-legged myotis emerge from their day roosts early in the evening (Whitaker et al. 1981a). Foraging activity occurs throughout the night, but is greatest during the first 3-4 hours (Adams 2003). Prey are caught aerially (van Zyll de Jong 1985) along forest edges and cliff faces, inside forests, over the forest canopy, and over water (Whitaker et al. 1977, 1981a, Warner and Czaplewski 1984, Thomas 1988, Nagorsen and Brigham 1993). This species is characterized by rapid direct flight (WBWG 2005). Home ranges of males and reproductive females in Idaho averaged 647 ha and 376 ha, respectively, although this difference was not significant due to the variability in home range sizes (Johnson et al. 2007). Seasonal movements. No information is available on seasonal movements. Threats. Loss of large-diameter trees and snags during timber harvest can negatively affect this species (WBWG 2005). High pesticide residues were found in long-legged myotis for at least three years after aerial spraying of DDT to control larvae of the Douglas-fir tussock moth (Henny et al. 1982), although use of this chemical has since been discontinued. Hibernacula may be lost by closure of abandoned mines without adequate surveys and from disturbance by recreational cavers. Roosts in buildings are vulnerable to pest control operations. Conservation measures. Forest management practices that result in the long-term availability of large snags (generally > 50-80 cm in diameter) with loose bark, distributed across all landscape positions are probably most beneficial to this species (Ormsbee and McComb 1998, Baker and Lacki 2006, Johnson et al. 2007, Arnett and Hayes 2009, Lacki et al. 2012). There is good evidence that long- legged myotis use trees and snags remaining after timber harvest (Taylor 1999, Johnson et al. 2007). Retention of patches of snags (e.g., at densities of more than 40 snags per ha; Baker and Lacki 2006) is also desirable because these bats require multiple roosts within localized areas. Creation of buffer zones around snags used by large colonies is recommended. Thinning of young ponderosa pine forests will speed the establishment of large trees and reduce the risk of stand-replacing fires (Rabe et al. 1998a, Baker and Lacki 2006). Implementation of more natural fire regimes can help create large snags. Minimization of human disturbance may be sufficient for management of rock habitats used as day roosts (Baker and Lacki 2006). Where eviction from buildings is necessary, appropriate steps should be taken to minimize negative impacts on the bats. Precautions to reduce disturbance should be taken when mine and cave surveys are conducted during the hibernation period. Winter inventories of bat use should be conducted at mines and caves considered for closure (i.e., blockage), with bat gates installed where hibernation is documented. Before pesticide spraying projects, surveys to identify roosting and foraging habitat of this species should be conducted to avoid spraying of important areas.